2005 yellowy headlight — is there a fix? I just picked up a 2005 and have the yellowed headlights issue. There are none I know of at the local junkyards and aftermarket assemblies go for about $200 for a pair. I'd rather not spend that. Question 1. Is this yellow all on the outside of the assembly or also the inside? Question 2. Are there any good chemical solutions for removing the yellow? The only thing I found on search was PlastX from Meguiar, and it was said that it didn't last long. Does anyone know of anything I could apply that will last for a while? I have an 05 coupe that needed a headlight bucket, too. It was cracked and had moisture inside and couldn't be saved. After some searching, I found headlight buckets on Rockautodotcom. They were $35.00 each so I replaced both. Good luck. Is there to fix a braided nitrous line??? 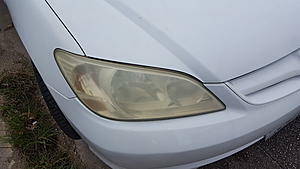 Quick Reply: 2005 yellowy headlight — is there a fix?